WHEN IT COMES to cooking, it’s all too easy to get stuck in a rut or be overwhelmed by all the options out there. But the secret to having something easy to cook every day is a simple repertoire of recipes you know well and you can adapt to suit your mood, your cupboards and your pocket. Yes, a full roast dinner is great on the weekends when we have time for carving and gravy. But midweek you want a fast, comforting fix and a one tray roast is absolutely foolproof. There’s an abundance of these recipes out there, mostly chicken-based but sausages are a great option too. Then you add chopped up veg, seasoning, into the oven, all in one dish and that’s it. Assembly should take no more than a few minutes and cooking should be under one hour. Find the right recipe and you’ll never look back. Can’t argue with that. Nigella adds orange zest to hers which keeps it moist and zingy and you should look for recipes that have a little extra flavour boost like this. For vegetarian versions, a quick Google will throw up some great meat-free options featuring cauliflower, aubergine and squash as the main ingredient. A stew is one of the most straightforward and satisfying recipes you can master and it doesn’t need much mastering. Stewing simply means long slow cooking in liquid, it can happen on the hob or in the oven. Economy is a bonus for this dish. As a rule heartier, inexpensive cuts of meat and root vegetables will stew best. 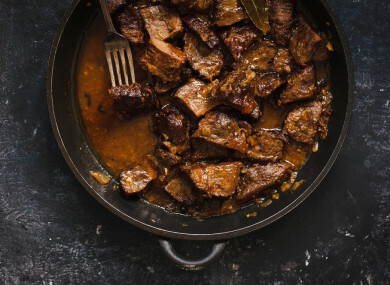 You want food that can stand up to a few hours of cooking and mingling of flavours that will extract the juices and tastes for a rich stew intensity. Use a little brandy to deglaze the pan after you fry the meat or add a tin of Guinness or bottle of craft beer. The end of a bottle of red wine is great too. Be confident with flavours. Loads of herbs, a teaspoon of Dijon mustard and black pepper always result in great flavour. Sometimes I add a splash of soy sauce or Yorkshire relish for that umami depth. She also recommends a slow cooker which can be a great investment for stew fans. This is up there with one of the easiest, speedy suppers where the payoff for the effort put in is phenomenal – and you’ll be surprised how adaptable a recipe it is. At its most basic this dish is spaghetti with bacon, Parmesan cheese and eggs and it should take no more than 15 minutes to put together. One could argue that a salad doesn’t really need a recipe – but the difference between an edible and a great salad is just a bit of thought before you toss it all together. Then, it can make an excellent side, lunch or dinner. Versatility is the advantage with salads. Get your basic ingredients ready then check your fridge and cupboards and then check again. Are there a few loose radishes or scallions in the bottom drawer? An egg to boil and crumble on top? Nuts or seeds that can be toasted and sprinkled across? Almost anything can be turned into a salad ingredient. In his book Cook Well, Eat Well, Rory O’Connell urges us to look at less likely salad ingredients like “shaved brussel sprout, tiny bits of kale or even finely shredded green cabbage”. Ideally, you’re aiming for contrasting but complementary flavours, textures and colours. And for dressing remember it should blend with as opposed to mask the flavour of your ingredients. A basic vinaigrette is one part vinegar to three parts oil, salt and pepper and if desired a teaspoon of mustard. Perhaps the most versatile and straightforward recipe is an omelette. It makes a light, quick, nutritious breakfast, lunch or supper with minimal effort and is super adaptable. Cooking bible Larousse Gastronomique warns us that “the success of an omelette depends as much on the quality of the pan and the quantity of distribution of the butter as on the cooking”. So get a heavy-bottomed frying pan for cooking and plenty of butter for flavour. Then it’s basically whole eggs, beaten, seasoned and cooked flat or folded and with as few or as many additions as you like. Darina Allen writes in her book Grow, Cook, Nourish that a classic French omelette is the ultimate fast food “but many a travesty is served in its name. The secret is to have the pan hot enough and to use clarified butter if all possible”. Lilly Higgins recommends adding cheese. “Caramelised onion and Cashel blue cheese is an incredible combination – or use dollops of cool soft goats cheese and then drizzle with harissa paste.” Omelettes are also are a great vehicle for making leftovers into a meal – chopped-up meat or vegetable leftovers are great added into a folded omelette. An Italian rice dish, the name risotto literally means ‘little rice’. It has a reputation for being difficult and finicky to cook but the reality is quite the opposite. It’s simply rice sautéed in butter or sometimes olive oil, usually with onion. Then hot stock is added a ladleful at a time. As the rice cooks and expands the starch oozes out which is what gives it the creamy consistency, not added cream (as is a common misconception). It does take a bit of stirring, which may put people off, but persevere says Alice Waters: “Risotto is actually a basic one-pot dinner that pleases everyone.” It’s adaptable to any food, tastes and flavours. A basic risotto bianco, delicious on its own, can also be a blank canvas for meats, vegetables, seafood and cheese. A good rule of thumb when adding raw ingredients, advises Waters, is to “add them at twice the normal cooking time”. So if you have prawns that normally take five minutes to cook, add them to the risotto 10 minutes before it’s done. This can be applied to almost anything. Play around with flavours. Darina Allen does a carrot risotto where she adds carrot juice to the stock and assures us this is “super delicious on its own or with pan-grilled lamb chops”. Clodagh McKenna adds dillisk to her seafood risotto. If there’s a dessert that is as universally appealing as it is simple it has to be fruit crumble. Comforting, nostalgic and a cinch to put together, I’ve often cobbled one together from seemingly nothing. At its most basic (and indeed its most complicated), crumble consists of a fruit base and a topping cooked in the oven until the fruit is tender and the crumble is golden and crisp on top. Traditionally the topping is made by rubbing fat into flour like when making pastry, then sweetening with sugar – but many modern recipes make use of oats or leftover bread. The fruit can change with the seasons or indeed what’s in your fridge, freezer or cupboard (some tinned fruits work great). Alice Waters has a strong list of suggestions: apple and pear, apple and blackberry, rhubarb, plum, peach and raspberry – you can really use any fruit. Use any fruit as a base – plums with orange zest, apples with blackberries, rhubarb with strawberries etc. And then cover in a crunchy blanket of buttery carbohydrates. Pure comfort food! I use a mix of rye and regular wheat flour, porridge oats, brown sugar, and a pinch of cinnamon to my crumble topping and I always use salted Irish butter. Ground almonds or hazelnuts can be added to the crumble topping too. It’s a great dish to experiment with and build confidence. Serve with softly whipped cold cream and everyone will love it/you. Email “7 simple classics every grownup should master (and how to nail them)”. Feedback on “7 simple classics every grownup should master (and how to nail them)”.